As of 2018, our policy is to build jQuery (normally either version 2 or 3) directly into themes; instead of linking to versions on an external CDN (content delivery network). Originally the case was made that versions of jQuery coming from an external CDN would promote caching. Browsing some websites might become marginally quicker if the web browser already had a cached version of jQuery in its memory. However the reality is that there are now almost an infinite number of jQuery versions in existence; and therefore the caching argument isn't really valid any more. Versions of jQuery have gradually become smaller, as support for older web browsers (like Internet Explorer 6 or 7) have been dropped. So very often, the loading impact of jQuery on completed pages is particularly low. Additionally there have been valid concerns raised in recent times, relating to privacy, when using versions of jQuery stored by private companies like Google or CloudFlare. Keeping assets (like jQuery) hosted on your own server safeguards user privacy. It also means that if a CDN goes offline, you are not left with a broken website! Most of the websites RapidWeaver users build are not large enough to see the full benefits of CDN-hosted jQuery. You are welcome to use a different version of jQuery in our themes. Alternatively you can choose to use jQuery from a different source (like a CDN). This involves some edits to your theme. As always, we recommend working from a duplicated and renamed theme, so that future updates do not undo your changes. Open the theme contents and then open the index.html file in your preferred code editor. Scroll down towards the bottom of the page. There you should see the jQuery call. Save the changes and close the file when done. If you need to add a different version of jQuery to the theme, this can normally be stored in either the /core/js directory or /scripts/ directory, replacing what is already there. 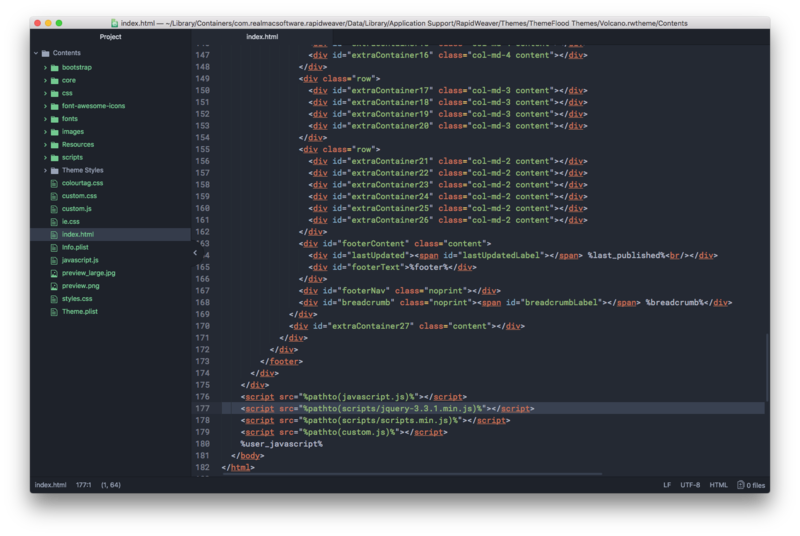 Most of the jQuery code in ThemeFlood themes is wrapped inside its own namespace / closure. This method isolates the code from other scripts or addons in the page. In turn, this can greatly reduce the risk of conflicts with other elements. Some themes include a custom.js file too. Code added to your custom.js file will be included on every page too, within our namespace / closure. You may find it easier to work with the custom.js file in your preferred code editor; where you have the benefit of features like syntax colouring, indentation, line numbers, find and replace, error checking etc.